THE ARAB uprisings are part of a 21st century battle against what can only be decribed as corporate fascism. That's the conclusion drawn by veteran investigative journalist John Pilger in a new article. Writes the Australian author and filmmaker: "The revolt in the Arab world is not merely against a resident dictator but a worldwide economic tyranny designed by the US Treasury and imposed by the US Agency for International Development, the IMF and World Bank, which have ensured that rich countries like Egypt are reduced to vast sweatshops, with half the population earning less than $2 a day. "The people’s triumph in Cairo was the first blow against what Benito Mussolini called corporatism, a word that appears in his definition of fascism. "Like the European revolutions of 1848 and the uprising against Stalinism in 1989, the Arab revolt has rejected fear. "An insurrection of suppressed ideas, hope and solidarity has begun. In the United States, where 45 per cent of young African-Americans have no jobs and the top hedge fund managers are paid, on average, a billion dollars a year, mass protests against cuts in services and jobs have spread to heartland states like Wisconsin. "In Britain, the fastest-growing modern protest movement, UK Uncut, is about to take direct action against tax avoiders and rapacious banks. Something has changed that cannot be unchanged. The enemy has a name now." LIBYA today stands on the brink of freedom, with its extraordinary popular uprising on the brink of defeating the corrupt and murderous Colonel Gaddafi. 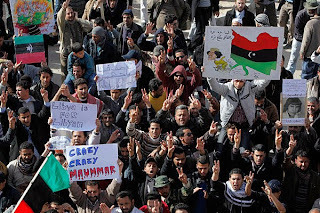 Large parts of the North African country have already liberated themselves from state control, with UK anarchist blogger Ian Bone suggesting Benghazi, in particular, resembles revolutionary Barcelona in 1936. But Gaddafi retains control of his capital and before Tripoli falls, nobody can be sure that the Libyan revolution will match the success of those in neighbouring Tunisia and Egypt. This is the bloodiest revolt yet, with those troops and mercenaries still loyal to Gaddafi - a close friend of Berlusconi just across the Mediterranean - not hesitating to mow down protesters in the streets. The courage of those Libyan revolutionaries prepared to fight bullets with rocks must surely be an inspiration to the whole world for years to come. For latest news see live coverage from Al Jazeera English, the February 17 website and the feb17 hashtag on Twitter. THE EGYPTIAN revolution was an uprising against neoliberalism and people must be careful that it stays that way. That's the conclusion of a thoughtful and well-informed article posted on the Al Jazeera website by 'Abu Atris' - the pseudonym of a writer working in Egypt. He says: "The demands of the protesters were clear and largely political: remove the regime; end the emergency law; stop state torture; hold free and fair elections. "But implicit in these demands from the beginning (and decisive by the end) was an expectation of greater social and economic justice. "Social media may have helped organise the kernel of a movement that eventually overthrew Mubarak, but a large element of what got enough people into the streets to finally overwhelm the state security forces was economic grievances that are intrinsic to neoliberalism. "These grievances cannot be reduced to grinding poverty, for revolutions are never carried out by the poorest of the poor. "It was rather the erosion of a sense that some human spheres should be outside the logic of markets. "Mubarak’s Egypt degraded schools and hospitals, and guaranteed grossly inadequate wages, particularly in the ever-expanding private sector. 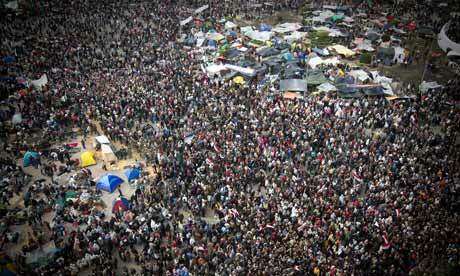 "This was what turned hundreds of dedicated activists into millions of determined protestors. "If the January 25th revolution results in no more than a retrenchment of neoliberalism, or even its intensification, those millions will have been cheated. The rest of the world could be cheated as well. "Egypt and Tunisia are the first nations to carry out successful revolutions against neoliberal regimes. Americans could learn from Egypt. "Indeed, there are signs that they already are doing so. Wisconsin teachers protesting against their governor’s attempts to remove the right to collective bargaining have carried signs equating Mubarak with their governor. "Egyptians might well say to America 'uqbalak' (may you be the next)." ANTI-AUSTERITY protesters in London invaded a council meeting and forced councillors out of the chamber as £79m of cuts were due to be passed. The Guardian reports: "More than 150 protesters have staged an occupation of Lambeth Town Hall after councillors were forced to move out of the official chamber and hold a vote on making cuts in private. "Demonstrators ranging from trade unionists to pensioners occupied the chamber for more than an hour, taking their seats in what they called a 'People's Assembly' and listening to speeches from those opposed to cuts in services including libraries, adventures playgrounds and schools. "Members of the Labour-run council, meeting to decide how to make £79m of savings over three years, had walked out of the meeting amid heckling from the public gallery by a number of people, who then joined the occupation in the chamber. 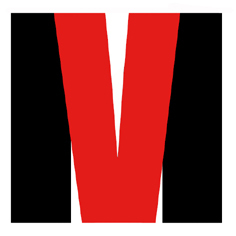 "There had been scuffles earlier as security guards tried to stop demonstrators outside the building attempting to enter." THOUSANDS of anti-capitalist protesters battled with riot police on the streets of Athens on Wednesday, during a 24-hour general strike. 16:50 (GMT+2) Athens: There is a call for a gathering at Syntagma Square at 19:00. So far there, six protesters have been confirmed as injured. Numerous police motorcycles and riot police are gathered along Alexandras Avenue. 17:37 (GMT+2) Athens: After a respite, there has been at least one more clash at Syntagma Square. The police attempted to disperse the calm crowd, and at least one person was beaten by as many as 10 police and has been detained. The situation has grown tense once more, and Syntagma Metro station is closed again. 18:35 (GMT+2) Athens: A crowd of hundreds ripped up the benches from Syntagma Square to feed a fire they had built in front of the Parliament. The police had tried to disperse the gathering by circling around the protesters menacingly, but people stayed their ground. After a while, the police dispersed the crowd by forming a cordon around them and then chasing them aggressively away, attacking them with teargas and beating them. 22:00 (GMT+2) Athens: There are 20-25 people trapped in one of the entrances to the Great Britain Hotel in Syntagma Square. They are surrounded by police and are presumed to be detained. An hour ago, 70 people occupied the Foreign Press Association of Greece. 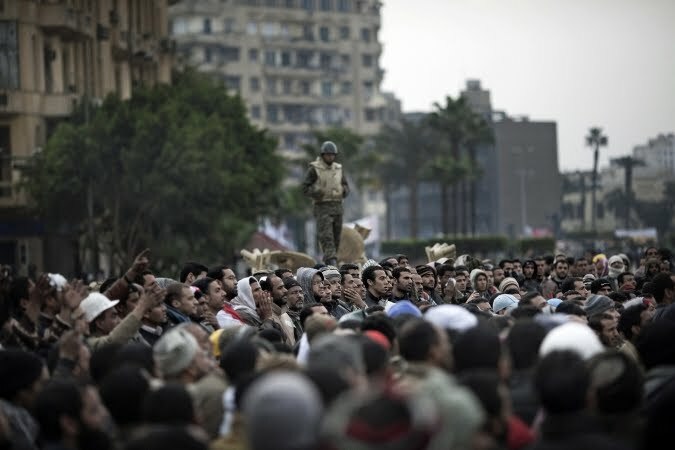 THE Tahrir occupation was a shining example of grassroots organising in action, says an in-depth account on the Reports From the Egyptian Uprising blog. It recalls: "Occupiers set up community barricades, crewed by both male and female volunteers, complete with piles of rocks to use as weapons in case of attack. "Medical clinics were set up staffed by volunteer doctors and surgeons. "Hundreds of tents and shelters were erected around the square, rubbish collection was organised and food was distributed. "At night the occupiers slept in front of the tanks surrounding the square to prevent the army from entering. "The Egyptian revolution was leaderless and self organised, the seven demands formulated by the Tahrir Square occupiers were: Resignation of the president, the end of the State of Emergency, the dissolution of parliament, the formation of a national transitional government, to elect a Parliament that will amend the Constitution to allow for presidential elections, the immediate prosecution for those responsible of the deaths of the revolution’s martyrs and the immediate prosecution of the corrupt and those who robbed the country of its wealth. "On the 11th February, the day after the largest protests yet and widespread strikes across Egypt, Mubarak, after an initial show of defiance, announced that he would step down and retire to the resort of Sharm El Sheikh. "Power was handed over to the ominously named Supreme Council of the Armed Forces and parliament was dissolved. The army has promised to amend the constitution and facilitate free elections. "They have, however, called for a return to normal – for an end to the strikes and to political protest. Tellingly, the Supreme Council refused to rescind the State of Emergency until ‘calm’ was restored. 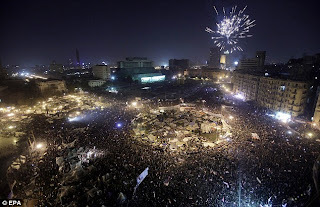 "Jubilation gripped Egypt. The Egyptian people who have lived most, if not all, of their lives under Mubarak’s rigid military dictatorship had successfully shaken off the dictator. "But the question is what will happen now? On Sunday the army removed the protesters from Tahrir square. "The fact that the army prevented cameras and reporters from recording the eviction, thus continuing the media blackout and repression of free speech of the Mubarak regime should act as a warning. "The Egyptian revolution, like the Tunisian uprising, is ongoing; strikes have been held by everyone from airport staff, public transport workers and nurses in Cairo to workers in the sweatshops of Mahalla al-Koubra and Mansoura to oil industry employees. "Egyptian banks, briefly reopened last week remain closed and the stock-exchange lies dormant. "The demands of the strikers represent the other side of the Egyptian rebellion, a call for an end to corruption, for better wages and for lower prices." SOMETHING "powerful" has manifested itself on the streets of Egypt and Tunisia, says anarchist blogger Paul Cudenec. He writes: "We are seeing the crackling of a revolutionary energy, an electric field of courageous defiance rising up from a new generation of human beings whose spirit has not yet been dulled and crushed by decades of miserable subservience. "There is no reason to think that the effects of this Wahn will be confined to the Arab world, even though the more immediate ramifications are likely to be felt in that region. "While the positive energy created by the Tunisian uprising was enough to inspire thre rest of North Africa, the resonance from the February 11 revolution is so powerful it will be felt all across the world. "Every subsequent uprising will simply charge up the atmosphere still further and encourage us all to believe that anything really is possible." 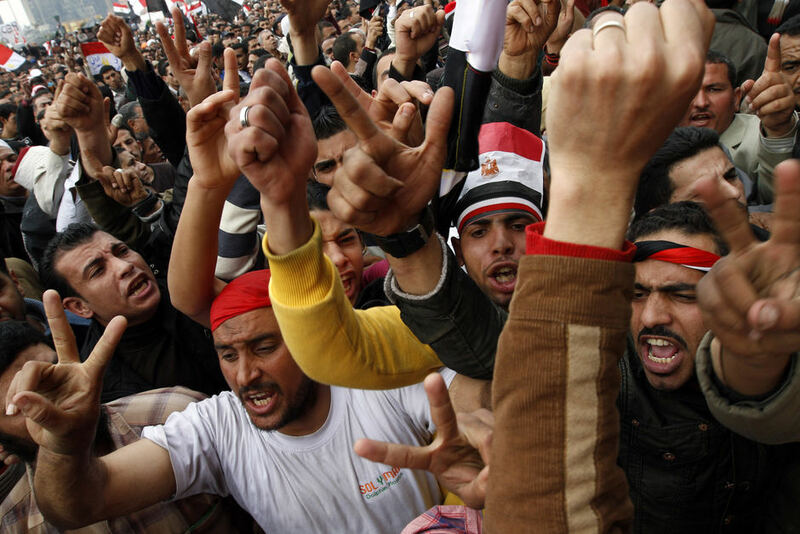 TREMORS from the Egypitan Revolution have already started to shake repressive regimes in Algeria and Yemen. Reports The Guardian: "Algerian police have beaten back around 2,000 demonstrators who tried to rally in central Algiers as aftershocks from the Egyptian revolution rumbled throughout the Middle East. 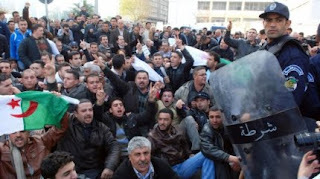 "Demonstrations in Algiers quickly turned to running clashes with police who had been ordered by the government of President Abdelaziz Bouteflika to enforce a protests ban. "Police took up positions throughout the centre of the city hours after the tumultuous scenes in Cairo, which are likely to have significant ramifications across the region. "Even before Egypt's Hosni Mubarak had stepped down, the 12-year regime of Bouteflika had been considered to be under most threat from the popular uprisings now galvanising the Arab states. "Wedged alongside Tunisia, where President Zine al-Abidine Ben Ali was ousted 30 days ago, and near Egypt, which fell on Friday, the unstable nation has many of the characteristics of both – a disenfranchised youth and rising prices of basic goods, such as sugar and cooking oil. "It also shares a large, pervasive security presence, authoritarian rule and a general sense that citizens are not benefiting from its wealth and resources. "Late in the afternoon, protesters briefly broke a cordon and officials say that 400 were arrested by police – who vastly outnumbered them. Most were then released. "The demonstrations were organised, as they were in Yemen, nearly 3,000 miles away, where at least 5,000 people, mainly youths, rallied in the capital, Sana'a to call for Egypt-style reform." 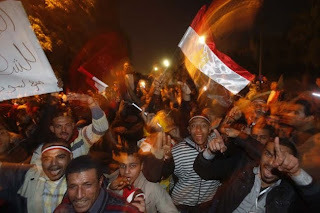 AMAZING scenes of jubilation in Egypt as Mubarak finally quits. The revolution is victorious! This seems a good moment to quote our own profile statement written a year and half ago. "How could we foresee a near future in which the hypnotic spell is broken, the scales fall from a billion eyes and those who say 'Enough!' are revealed, all of a sudden, to be a gale force wind of revolt, a tidal wave of insurgent delight sweeping all before it, a minority so vast it will change everything?" THE MUBARAK regime’s dirty tricks will result in its own destruction, says an in-depth analysis on a blog dedicated to the Egyptian uprising. Abdel-Rahman Hussein examines all the ways in which the state has so far tried to halt the revolutionary tide - brutality, shutting down the internet, withdrawing police, deploying state thugs, spreading lies on state TV etc etc. He writes: "What arose from that State TV propaganda – masterminded by Information Minister Anas El-Fiqi – can only be described as a disgusting witch-hunt of journalists and foreigners in Egypt that led to the stabbing of Greek and Swedish photographers, and neighborhood watches suspecting even Egyptians of being foreigners and therefore in need of detainment. "A girl who claimed that she was an activist who was trained by Israelis and Americans in Qatar to create chaos in Egypt aired on Mehwar TV in pixilated glory turned out to be a reporter for the newspaper '24 Hours' who had fabricated the story and has now been suspended. State TV presenter Hala Fahmy resigned her post and headed to Tahrir Square, not before telling Al-Jazeera that El-Fiqi was personally involved with the thugs who attacked Tahrir Square on Wednesday Feb 2." Says the author: "Not that it was ever the most benign of regimes at the best of times, with a brutal human rights record and a curtailing of personal and civil liberties the norm. "However, the scandalously dirty tricks put into play since Jan 25th would spell the end of any government in any country in the world. The fact that it hasn’t so far in Egypt is an indictment of the spineless attitude of the international community towards their strongman Mubarak." THE inspirational protesters occupying Cairo's Tahrir Square are refusing to leave until the hated Mubarak regime has fallen. An up-beat video from Press TV shows people from various backgrounds and parts of Egypt united in their determination that the revolution will succeed. Meanwhile, former Arab League Chief Clovis Maksoud told Press TV the Egyptian revolution against President Hosni Mubarak's regime is also an uprising against Israel. "The Egypt revolution is against Israel too,” Maksoud said on Tuesday. He further pointed out that this rebellion is also against Egypt's peace treaty with Israel. “Part of this revolution is going to project a new foreign policy whereby Egypt will freeze its historical role and be a deterrent function against (the) Israelis' expansions, aggressions and racism,” he went on to say. “That is why the foreign policy of the United States on the strategic power in the region is attacked by the revolution,” he noted. SHOCKING documents exposing the Egyptian state's plans for dealing with opposition protests have been revealed. This document includes terrible measures intended to intentionally spread chaos and terror in the ranks of the people and start a campaign to mislead the media. The full details can be found on the Angry News From Around the World website. - Enroll many thugs, pay them well, meet with them in their homes or in public meeting places, (...) the information on the mobilization plan (...) with the aim of sowing chaos gradually. - Control all members of parties and organizations, coordinate with publishers and communications services, impose complete control over the messages transmitted and received. - Means of communication (Mobile Internet) will be cut from Friday, 28-01-2011 at six o'clock in the morning, while keeping mobile phone communication, therefore, all officers and members must use this means of communication and make sure they are encoded. - Simulate a partial failure of the police from Friday at 16:00 local to pretend that the protesters have the upper hand and then allow the infiltration of thugs to spread chaos (...). - Disseminate information through the media about looting, order women of the security services contact the media and claim they are horrified. - Spread false rumours through the international media, and give the local media the task of correcting them in order to restore public confidence in them. - Monitor the situation on the ground and charge members of security to count the demonstrations and know their addresses, in order to send groups of thugs to their neighbourhoods and to remove them and thereafter empty the streets of demonstrators. 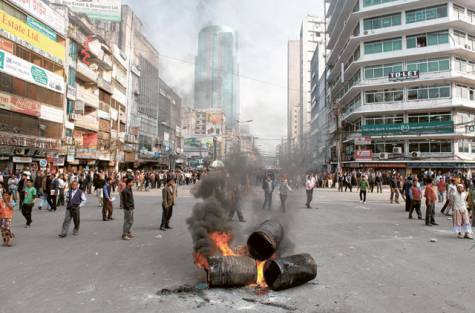 RIOT police patrolled the streets of Bangladesh's capital Dhaka on Monday as angry opposition to the regime grows. Rising food prices and a stock exchange crisis have fuelled popular discontent. Passions have also been raised by Prime Minister Sheikh Hasina's plans for a new airport to be named after her father. The original scheme has now been abandoned following passionate protests and the death of a policeman. Al Jazeera reports: "Bangladesh police said that at least eight buses were set on fire on Sunday night, just hours before the strike was enforced. "A homemade bomb reportedly exploded on the campus of a Dhaka university, injuring two people. "Earlier on Sunday, hundreds of angry investors had also gathered to protest outside the Dhaka Stock Exchange, following the latest in a series of stock exchange collapses." 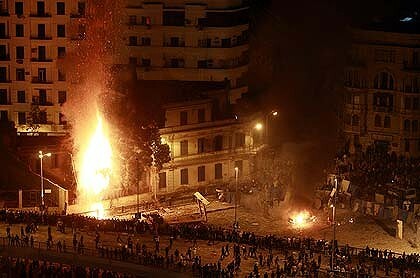 THE EGYPTIAN revolution remains on a knife edge as the Mubarak regime sends its thugs in to attack protesters. Although corporate media have tried to classify the violence as clashes between 'rival groups of protesters', this is clearly untrue. Eye-witness reports on Al Ajzeera describe how thugs captured by revolutionaries in Tahrir Square have been found to have police ID. A useful new blog on the Egyptian uprising explains the role of the notorious Baltagayyah. It says: "Loosely translated to 'thugs', Blatagayyah are more than just your run of the mill voyous. "The word has a special relevance for just about everyone in Egypt: that of the paid paramilitaries of the Egyptian state. "There are a lot of these fuckers, and they are the prime agents provocateurs of the Egyptian state. Conspiratorial stories of security services actually perpetrating looting, attacking peaceful protestors, or destroying property, too often turn out to be true. "Many have been apprehended by ordinary citizens who have discovered state security IDs on them (they appear to have been ordered to carry such IDs in case they are stopped by the army). "Let’s get this straight, this is not the worry about a few bad seeds on the murky fringes of the para-state. The Mubarak regime has maintained a concerted policy of introducing plainclothes thugs into protest situations, sometimes armed with weapons, but always with the impunity to violently quash even the slightest dissent (and the presence of these baltagayyah is inevitably in addition to the obscene amount of uniformed security officers the government will usually deploy to any demonstration, no matter how small). "It’s not always certain whether these thugs are full time employees of the regime or simply bored individuals with a penchant for violence and a hankering for a few extra bucks and a chicken sandwich in exchange for a day’s work of beating the hell out of some demonstrators. "What is certain is that rarely does any political protest or demonstration go down in Cairo without a healthy dose of baltagayyah violence. "As far as the current protests in Egypt are concerned, we’ve seen them setting fire to cars, destroying small businesses, terrorizing protestors and ordinary citizens alike and looting neighborhoods. "All this while disguised as 'ordinary Egyptians'. This has been enough to confuse and distort much of the international reporting of protest events. "What must be understood is that the baltagayyah are sowing fear and violence to deliberately frighten and terrorize ordinary people. "They work by making Egyptians and the outside world question who is perpetrating this violence, but this gruesome charade must be known and publicized because the only result of such fear and doubt is further violence against demonstrators."